At LKMco we are deeply concerned by the profound links between children having Special Educational Needs and Disabilities and growing up in poverty; as well as the additional barriers these children face in accessing the support they need. Urgent action is needed to remove those barriers. The government has had some success in encouraging schools across the UK to direct more resources at children from low-income families. We hope that our new report for the Joseph Rowntree Foundation will now encourage schools and policy makers to place improved support for special educational needs at the heart of the battle to break the link between poverty and educational underachievement. 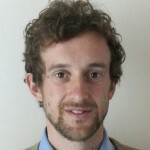 Give SEND the same level of priority in policy as socio-economic forms of disadvantage. Help teachers and other school staff improve their skills in teaching children with special educational needs. Of the pupils who are eligible for free school meals in England almost a third are identified as having SEND. Seven out of ten excluded pupils in England have SEND. Almost half of all pupils who are eligible for free school meals in Northern Ireland have SEN. In Wales, pupils eligible for free school meals are twice as likely as pupils who are not eligible to have ALN (additional learning needs). In Scotland, there is a notably higher prevalence of ASN among children living in the most deprived 20% of families. For example, six times as many children in the most deprived families are identified as having social, emotional and behavioural difficulties compared with the least deprived families. One major study found that difficult family circumstances can mean that children are more likely to develop some forms of SEND, such as Social, Emotional and Mental Health difficulties. 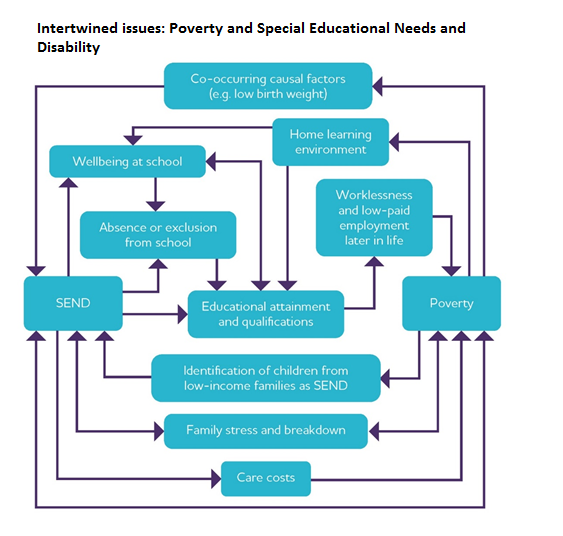 Families of children with SEND are more likely to be pushed into poverty (perhaps as a result of the costs and/or family stress associated with their child’s SEND status). Why are so many children with SEND excluded from school? The evidence isn’t clear and we need to find out why. It may be because of schools struggle to manage behavioural difficulties amongst, for example, children with Social Emotional and Mental Health needs. It may be because of lack of support for children with special educational needs in schools leading to behaviour difficulties. 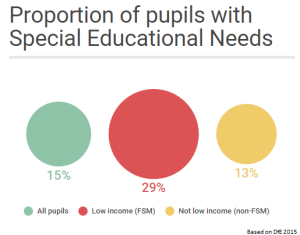 It doesn’t have to happen – far fewer pupils are excluded from Special Schools, perhaps because higher levels of per-pupil funding allow for more individual support. This is why we argue that extra funding should be available for children with special educational needs who are at risk of exclusion in mainstream schools. What is Government getting wrong when it comes to special needs? It’s important to recognise positive steps such as an increased recognition that all teachers have a responsibility to cater for SEND pupils’ needs, not just specialists. Government needs to ensure children with special educational needs are given the same priority as children with other forms of disadvantage. Government needs to make sure that pre-school settings and schools have adequate support and challenge so that all settings can match the quality of the very best. Why do children with SEND achieve less well? Pupils with SEND are a very varied group so it’s impossible to point a finger at one thing. We’ve outlined 10 barriers that could be removed or reduced, ranging from lack of early identification of need and help for their families through to variable quality of advice for young adults with special educational needs who are about to leave school. Our report sets out a number of wide ranging recommendations. The bottom line is that these need to be addressed urgently and that provision for special educational needs should be given the same priority as other forms of disadvantage. Don’t we expect children with SEND to do less well anyway? Given the huge variety of needs it’d be wrong to have one-size-fits-all expectations. Children with special educational needs do better in some settings – there are examples of schools where special needs provision is excellent and SEND pupils flourish as a result. We urgently need to make sure all schools have support to match these standards. In particular it’s important that those living in poverty have the same access to high quality provision as those who are better off. Wouldn’t children with SEND be better off taught in other schools? That’s a decision to be made on an individual basis depending on what’s best for each child. There are over a million children in UK schools with special educational needs. In some cases their needs will be best met through specialist provision, but for most, high quality provision within the mainstream is best. It depends entirely on the individual child. Have academies made things worse for children with special needs? There are many academies whose provision for children with special educational needs is excellent. At the same time, our research revealed concerns that other academies may not offer the same access to children with special educational needs as they do to other children. However, the same could be said of some non-academies.